German snipers were some of the most feared units during the second world war. After the invasion at Normandy, the German forces were forced to mount a retreat form the approaching allied forces. 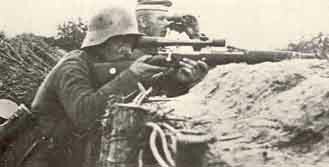 As the German forces retreated, German snipers covered their retreat. It is reported that half of the American forces killed, met their demise at the hands of a well trained German sniper. Another innovation that is credited with the German snipers are the emergence of so called "Suicide Boys." In previous engagements, snipers were known to make as many shots as they could safely, then withdraw to a safe location. Increasingly, snipers were not leaving their posts to withdraw to safety, instead they were holding their positions until the Allied infantrymen were right on top of them. This resulted, more often than not, with the death of the German sniper. The persistent German snipers had a huge impact on the morale of allied soldiers. Clearing out the well hidden german snipers from there hidden spots was laborious. Allied troops stopped saluting their commanding officers, as not to let snipers know who the leaders were. Allied troops also began to crouch when they walked. The German snipers were to be feared at all times. A famous german sniper during the second world war was Josef Allerberger. This Austrian born sniper is credited with two-hundred-and-fifty-seven enemy kills. He was known for using the Wehrmacht camouflage technique, in which an umbrella frame is covered in leaves, and the sniper lays behind it. There were also counter sniping measures being taken by Allied forces. The extensive anti-german sniping done by Vasily Zaytsev during the battle of Stalingrad has been celebrated in several fictionalized accounts by films, but the fact remains that he was actually credited with killing over two-hundred-twenty-five german officers and soldiers.